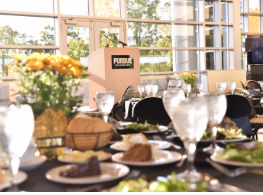 The goal of Purdue Conferences is to ensure that your conference, symposium or event is a success. Whether your group is six people or 6,000, we have meeting space for you. Our clientele has included students, religious groups, sports camps and international conferences. So, we're ready for your event … whoever you are. Not in the Midwest? Not a problem. We’ll bring Purdue to you! We want to plan any program you hold, anywhere you hold it. We have conducted conferences throughout Indiana, across the country and around the world. Our recent global reach has included events on six continents. Combining skill, enthusiasm and an eye for detail, our team goes beyond mere professionalism by striving for perfection every time. Make your event memorable at one of our numerous distinctive venues, which include historic spaces, concert halls, outdoor areas and more. When you partner with us, you're tapping into our team's 50-plus years of collective events-planning experience. Familiarize yourself with the Purdue Conferences staff — including our administrators, our sales team and the coordinators who make it all happen.